Hall of Fame men's basketball coach known for his success at both the University of Kansas and the University of North Carolina. He became the first coach to lead two different schools to at least four Final Fours and won NCAA Championships in 2005, 2009, and 2017 with North Carolina. He played for North Carolina's freshman team and, while still in school, watched Dean Smith lead varsity practices. He eventually became an assistant coach under Smith. He won the Associated Press Coach of the Year award twice, once at Kansas and once at UNC. He married Wanda Williams in 1973. He and Wanda have a son named Scott and a daughter named Kimberly. 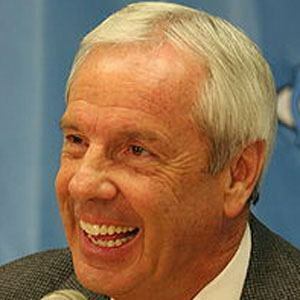 He led the effort at North Carolina to recruit Michael Jordan.